When you know how personal loans really work, you’ll see how helpful they are for financing important purchases like home renovations, paying off debt, and much more. If you don't know enough about personal loans and how to use them, you could end up paying way too much. We think we know how to use personal loans and how to make the most of them. While the basics of getting a personal loan may be simple, there are a lot of things about personal loans even the most financially aware among us don't know. Without careful consideration, you could end up with a high-interest rate, causing you to spend too much every month just to pay down principal. Check out this list and avoid making long-term, costly mistakes. No getting dressed up and going to a meeting at a branch. The online peer-to-peer finance category is booming, with lenders like Prosper, Lending Club, Peerform, and SoFi competing to loan you money. These lenders handle everything online and offer APRs lower than banks and credit unions. Borrowers with excellent credit and a high monthly income can get rates as low as 4-5%. Say you decide to borrow a hefty amount of cash from mom and dad. To prevent misunderstandings and rifts in the family, you can make it legal and official with promissory notes from sites like Rocket Lawyer or LegalZoom. If you're borrowing money to buy a home, the loan must be properly secured in order to take advantage of the mortgage interest deduction. Is your credit not strong enough to get a loan approved? Some lenders will accept a co-signer, to secure the loan debt. If a relative or family friend with a longer history and more impressive credit rating agrees to put his or her credit on the line for you, you may be approved for more money than you thought. Wells Fargo & Co. is one private lender that welcomes co-signers on personal loans. 4. No Co-Signer? Get Them to Vouch! "Vouching" is like co-signing light. You can ask someone to provide their contact information as a credit reference, which helps to make you look more responsible and like a better candidate for a loan. The credit reference does not make any promise to pay off the loan should you default. He or she is listed to provide information on you, such as your whereabouts, in the event that you stop making payments. If your credit is great and you're able to pay off a loan quickly, you might want to consider treating a credit card with a zero-percent introductory APR as a personal loan. Of course, you'll need to make sure the credit limit is high enough for your needs. You'll also have to be confident you can pay off the loan within a year, or you will get eaten alive by a future high-interest rate when the zero-percent timeline ends. Credit cards are a better choice than a personal loan sometimes. But that's nothing compared to payday loans. Sure, the interest rates on personal loans start out very low, usually less than 10%. But take a look at the upper limit and you will see you do not want to be there, ever. Borrowers with a high debt-to-income ratio (the amount of debt you have compared to how much money you earn) will often receive a high-interest rate like this. And this is nothing compared to the high rates on payday loans. Depending on where you live, a payday loan can cost you 582% interest! Keep in mind payday loan terms are on average meant to last only two weeks, so if you borrow $500, you will pay $100 interest. This averages out to an annual percentage rate of more than 500%. Sadly, many people don't pay the loans back, meaning they often pay more in interest than the actual loan amount! Beware! 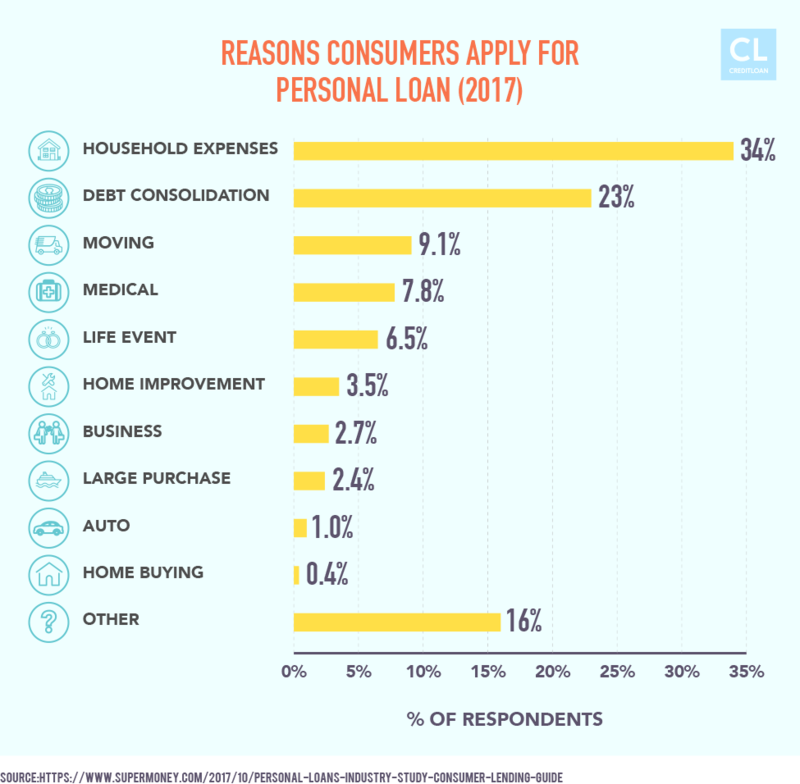 Even though the average amount people borrow is $8,000, according to Citi Bank, personal loans can be obtained for much, much more than that – like up to $5 million. A Home Equity Line of Credit, or HELOC, is a form of secured loan that can be taken out in the millions. It works like a credit card, but you're borrowing against the value of your house. The lender will provide you a credit limit depending on your financial status and your credit rating. Wells Fargo offers these small business loans up to $1 million and Bank of America offers them up to $5 million. To tap the funds, you can simply write a check or use a credit card connected to the account. Your total loan amount cannot exceed your credit limit, but payments are only made on the amount you actually borrow from the bank. These types of loans are commonly used for home renovations. Chase offers HELOCs between $50,000 and $500,000. Time is on your side when it comes to personal loans, especially with online lenders. While a typical turnaround time is three days, with all your documents available and no snags, a personal loan from an online lender can be approved within hours. In some cases, you can receive the money the same day. Otherwise, the wait is not long. It's typically one to two business days. The average is about 7-11% interest on a personal loan, but in certain conditions, you can lock in a much lower rate. 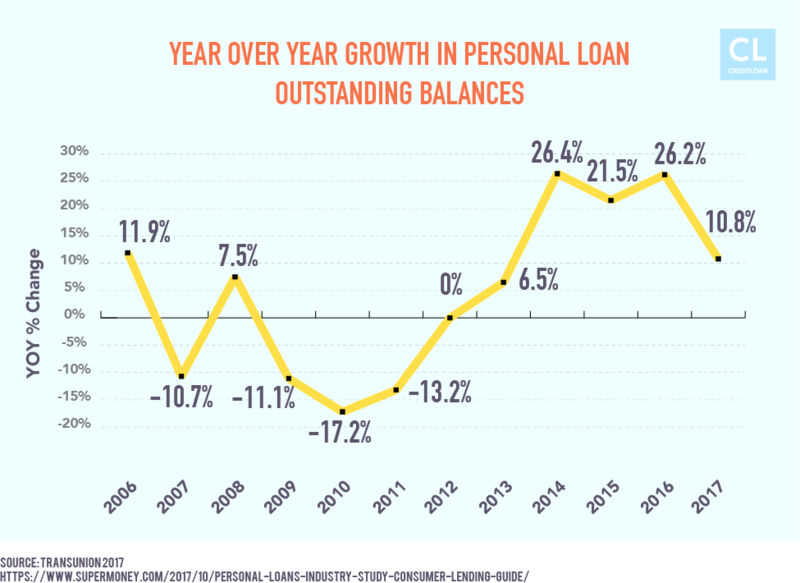 SoFi and LendingTree advertise 5.99% rates for borrowers with excellent credit, and when you sign up for auto pay, SoFi's rates drop to 4.29%. Your balance will not vanish! Just as with student loan debt, if you default on your payments, the lender has a lot of options – such as seizing money in your bank accounts or repossessing your car or another item as collateral. If those tactics fail, private companies will usually sell the loan to collection companies, which can then garnish your wages. Your credit rating will also go into free-fall. It's not advisable in any way to weasel out of repaying your loan. Although your terms are established when you take out a loan, they aren't set in stone. With the right attitude, you can renegotiate your monthly payments, the length of repayment, or both. Getting in touch with a real person is key (visit the bank in person), and be prepared to discuss your circumstances and the reason the lender should afford you more time or a better rate. Lenders want their loans repaid, and will not refuse a reasonable offer. 12. You Don't Need Credit! Getting a loan with no credit actually happens. Borrowers with bad credit, little credit, and credit scores in the 600s can be approved for personal loans, although the amounts are usually lower, typically $1,000-$2,500. An average annual percentage rate on a personal loan like this can range from "pretty good" 6-7% all the way to "horrible" 29-35%. If you have a low credit score and want a personal loan, it is especially important to find out if the lender will do a "soft pull" on your credit before offering your rate. This way, your credit rating won't be damaged more in the process. Be careful of unscrupulous lenders looking to scam potential borrowers. Don't pay upfront fees. Remember that you should never pay anything simply to apply for a loan. If a potential lender demands payment to evaluate your credit history and other financial information, run the other way. Contact them—not the other way around. If a lender is badgering you, whether through phone calls, mailings, or online, consider that a big red flag. Legitimate lenders of private loans simply don't need to be this aggressive to attract borrowers. Guarantees are bogus. No legitimate lender can promise that they'll approve your loan application before evaluating your finances. Even payday lenders need proof of income before they'll make a loan. Verify, verify, verify. Make sure you double-check the lender's physical address, which should be readily available. Also, consider looking them up with the Better Business Bureau or your state banking regulators. You should feel in control. Take your business elsewhere if a lender threatens you in any way, tries to dissuade you from considering competitors' offers, or tries to get you to borrow more than you owe. It's never a good idea to apply for many loans at the same time because lenders will think you are desperate. But if you're having trouble finding a good interest rate on one large amount of money, you can take out two personal loans in smaller amounts. Be sure to research each lender, and ask if there are any prepayment fees before you sign. Some people see the word "apply" online and click the button without having the first bit of knowledge about their financial standing. What's worse is that many lenders do a "hard pull"—a formal credit check by lenders that can temporarily lower your overall credit score—on your credit when you apply for a personal loan, which can knock down your credit rating further. Do your research on different lenders, terms, and how much you want to borrow. If you need $100, and there is a 3% origination fee, then you'll need to borrow $103. Not all lenders charge an origination fee, but when they do, remember to tack that on to the loan amount. Not many people understand this, but Annual Percentage Rate, or APR, is a more comprehensive rating of how much the loan will cost you. APR takes into account the fees, points, and how much you will pay overall. Percentage rate, on the other hand, is only the percentage of interest the loan will accrue. So while the difference may only be a fraction of a percentage point, the APR is truly a better measure. Think beyond a house or a car. Pretty much anything that can be bought or sold can count as collateral. tires, and even specialized pumpkin seeds. That was a lot, but the point is, think outside the box and it never hurts to ask. There are loan issuers who specialize in more specific forms of training, such as truck driving or bartending schools, medical procedures, commercial learning centers, seminars, and even dating services. You may qualify for a short-term loan for this kind of education because you will earn more money in the future. Even a simple continued learning or continued education course could improve your earnings. When I worked in Nuclear Medicine at a local hospital, the opportunity to take on the role of the Radiation Safety Officer was presented. I had to take certification courses out of state for this, but I increased my salary significantly by taking on the role and getting the proper certifications, all within a few weeks' time, and my employer paid for the certifications. Which of these 19 things did you find the most surprising or unexpected?